Peaceful Heart Alpacas is run by Sharla Willis, her parents Mike and Linda, and her son David. 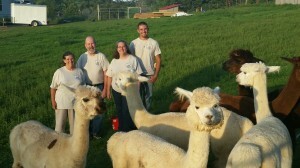 We were seeking a peaceful lifestyle where we could spend time working together outside, and we found it with our alpacas among the Blue Ridge Mountains. 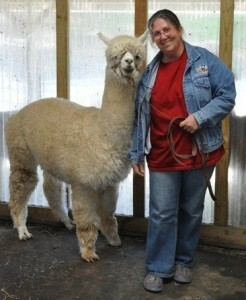 We began looking into alpacas in 2005, after Sharla started spinning. 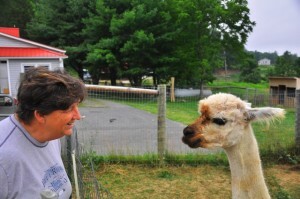 She loved working with alpaca, and quickly was hooked on this incredible fiber. Soon after we had the chance to meet some alpacas up close at a Fiber Fair and started on the road to investigating the alpaca lifestyle. It was a short trip for us as we soon realized that this was the perfect life for us. David loved anything that involved animals and/or being outdoors; Sharla was looking for a small farm; Linda had already fallen in love with ‘those cute alpacas on TV’; and Mike was impressed as we visited a number of alpaca farms and talked with alpaca farmers. By the end of the year we had purchased our first alpacas and were searching for our dream farm in the Blue Ridge Mountains. We found the perfect place as we were driving on the Blue Ridge Parkway one evening. A small, old farmhouse with springs, creeks, trees, and plenty of good pasture land. We moved in February 2006 and started to work getting the property ready. We built a barn and sheds and began fencing. As we got each pasture fenced in and a shed ready for them to use, we began moving our alpacas home. By the end of the year, everyone was on the farm and we had had our first two crias born. Since then, the farm has continued to grow and expand in ways we did not initially expect. Our 100 year old farmhouse has proven to be the perfect location for a three room store, full of alpaca products both locally made and fair trade certified from Peru. One room has become a fully stocked yarn shop with alpaca yarns of every weight and color as well as knitting needles, crochet hooks and patterns. Our middle room is full of yarns and fiber from our alpacas, and things that we make here on the farm. We opened our farm and store to the public in June 2006, and we also began making all our products available online. It was no surprise that Linda and Sharla have become weavers and knitters in addition to Sharla’s lifetime love of crochet, but nobody expected Mike to create such lovely handwoven shawls. He’d never had a chance to explore his creative side, but has proven to have a great eye for color and loves to weave. Our love of fiber arts led to the creation of our fiber art classes throughout the year, exploring all the wonderful things you can do with alpaca fiber. In October 2008, we held our first weaving class in our new fiber studio located in the upper pasture surrounded by alpacas. 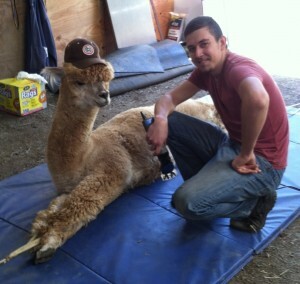 David continues to love being outside and working with the alpacas. 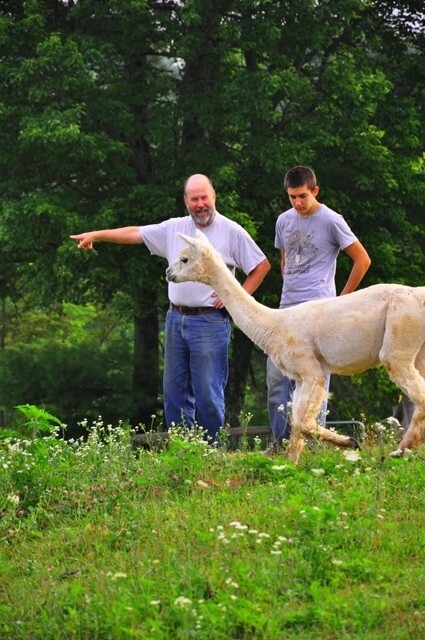 Since 2000, he has operated an alpaca shearing business, Iron Heart Shearing, that has grown to serve over 35 small farms in the area in addition to shearing all of our alpacas. It all comes back to the alpacas. We love being with them and getting to know their unique personalities. Since our first birth on the farm in September of 2006, we have seen 80 births on the farm, and we get just as excited with each birth as when our first cria was born. 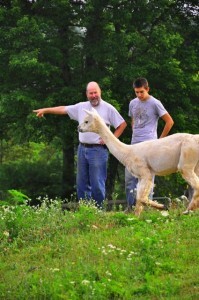 Our farm has grown to as many as 60 alpacas over the years. Our herd currently has 25 members, though that number changes with births and sales. We love to help others as they start their own farms. We hope you’ll give us the chance to share the joys and challenges of raising alpacas with you. Stop by the farm or give us a call at 276-728-4950. Photos taken by Karen Bopp of Barking Beagle Studios.